I saw Dr. Wayne Dyer the other night, and his daughter sang Don McLean's Vincent. I hadn't looked at the painting or listened to the music in quite some time, so I thought that I'd put together a page to ponder and enjoy. I have also included Anne Sexton reading her own poem The Starry Night. I'm not sure I enjoy it very much, but I've only listened to it a few times. Let me know -- what do you think? Click on the Play button to hear the music first (1.8MB) then feel free to click on the painting to view the full size version (500K) while enjoying the music. Vincent van Gogh. (Dutch, 1853-1890). A poet's (macabre) take on the painting. So, what do you think about Starry Starry night and Vincent? It's a great painting. A piece of artwork does it's job when it makes people stop and think about it. It is so refreshing that one painting can cause so many individual interpretations. The dean of our art school once said to me, "a true artist is someone who can capture a moment and make you see it differently". Hmmmmmmm. That was the first time I ever put the two together!!!!!!! Beautiful, love the words and love the painting. I listened to this yesterday and it annoyed me. Now I can't get it out of my head and I like it. I never knew that song was about that. The more I think about it, the more I like it. I've added some interesting elements alongside; do you think these are (some of) the paintings being discussed? PROFOUND! Thank you Ron! I was never a Do McLean Fan. Felt like I was hearing the song with new ears! i saw the same program this afternoon and it has been haunting me eversince which is what lead me to your posting. great job. 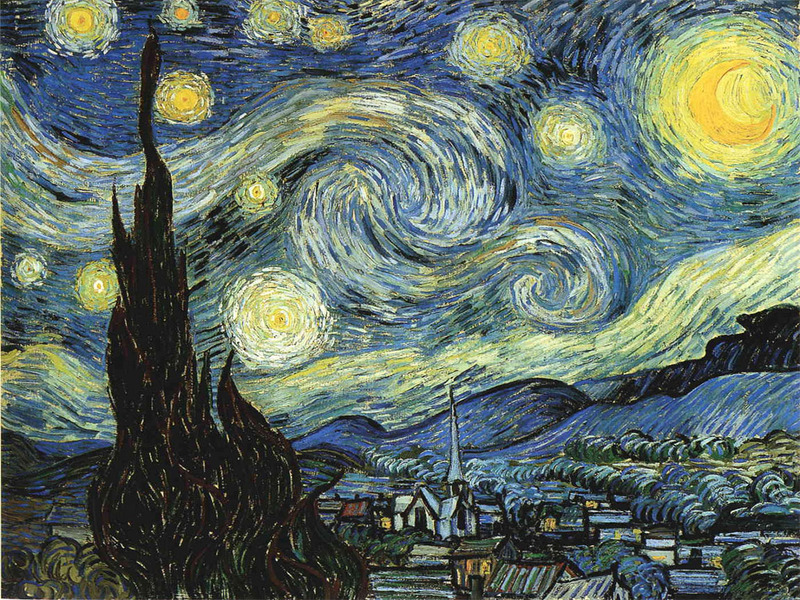 ALWAYS loved vincent's starry starry night but never really listened to the song and had no clue it had anything to do with him. Dwyer gave us a lot to ponder. Way cool, thanks for putting it out there for us Ron. I am just looking at this (after all of your coughing in the Sheepie in Art post! ). I think the song and the paintings go really well together. Van Gogh's work is so beautiful. I love the movement and colors in his paintings. His story is somewhat tragic, and the song is a nice tribute. I don't know much about Don McLean, except that he also sang the American Pie song... that one is about the plane crash with Buddy Holly, Riche Valens, and the Big Bopper, right? I guess he liked to sing songs in tribute to other artists. That's nice. Thanks for the cultural posting. I listened to this again this morning and now I cannot get the song out of my head. At least it's one I enjoy. It was while he was living in Antwerpen that Vincent began to drink absinthe heavily. He was treated by Dr Cavenaile whose surgery was near the docklands, possibly for syphilis; the treatment of alum irrigations and sitz baths was jotted down by Vincent in one of his notebooks. will someone please tell me where the play button is locate. This song makes me realize how tragic most of Vincent's life was. Before I just did my project all i knew about him was that painted starry night and that he cut his ear off..... but now i know what he really did in his life. i like how the song goes wiht the picture. thanks for sharing this!